Scuba divers frequent the waters off Ruckle Park, drifting among the castle-like caves or floating above the bountiful ocean floor, where they will find a profusion of Plumose anemones, sponges, nudibranches, octopuses, seastars and giant barnacles. On shore, birdwatchers can often catch sight of cormorants, grebes, guillemots, eagles, grouse or quail. In addition to its natural beauty, Ruckle Park is an area rich in cultural history. Irish emigrant Henry Ruckle first homesteaded here in 1872, marrying Ella Anna Christensen in 1877. Their descendants have farmed the Salt Spring property for more than a century. The Ruckle family donated their land to BC Parks in 1972 for the creation of Ruckle Provincial Park. The family still operates the Active Farm area of Ruckle Park and maintains several residences through a Life Tenancy Agreement established with BC Parks at the time of the donation. The active farm portion of Ruckle Park is not open to the public. Visitors are asked to respect this property and to not interfere with the farming operation. Due to ongoing interactions with farm livestock, BC Parks has designated some portions of the park trail system as closed to dogs. This change is in effect until further notice. Park visitors will still be able to enjoy dog on leash areas in the lower day-use and campground areas and the coastal trail to Yeo Point. Signage is in place identifying restricted areas and directing you to dog appropriate locations. Thank you for your cooperation. Carpet burweed (Soliva sessilis) is an invasive, introduced plant that has been discovered in Ruckle Provincial Park. Efforts to eradicate the plant are ongoing and include the creation of a fenced quarantine area to exclude seed dispersers (people) from one of the large meadows, and the use of work crews to locate and effectively deal with the plants. To find out more about the origin of burweed, its spread throughout the world, its effects on playing fields and golf courses and its history at Ruckle Provincial Park, view the burweed poster [PDF]. During the months of April, May and June the wildflowers will be in bloom certain areas of the park, particularly around the group sites. Adults and children who may be prone to allergic reactions are advised to take necessary precautions and to use the mowed paths around the picnic tables and fire rings and the main trails as much as possible. The remainder of the grasses and wildflowers will be cut in early July after the bloom has completed its cycle. The water system is shut down for the winter season between November 1 and March 15. Group campsite reservations are accepted at this park. 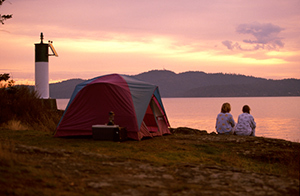 Group campsites must be reserved through Discover Camping. Located on Salt Spring Island in the southern Gulf Islands, Ruckle Provincial Park is situated 10 km from the Fulford Harbour ferry terminal along Beaver Point Road. BC Ferries offers service to Salt Spring Island from Victoria (Swartz Bay) and Crofton on Vancouver Island, and Vancouver (Tsawwassen). The closest communites are Ganges, Fulford Harbour, Salt Spring Island, Sidney and Victoria. Cultural Heritage: First Nations used this area for shellfish gathering, camas harvesting and settlement. The Ruckle Farm is the oldest continually operating farm in British Columbia. The Ruckle family began farming here in the 1870’s, and continues to farm here today. Conservation: Ruckle Park is one of the largest provincial parks in the Gulf Islands and protects a mosaic of wetlands, flowering Garry oak meadows, older forest and shoreline habitats. Strong tidal currents create the environment for rich kelp forests offshore. Kelp forests are important feeding areas for fish and attract many birds and mammals. Endangered and threatened species on land include Macoun’s meadowfoam, Nutall’s quillwort, sedges and the western screech owl. Habitat for the rare brittle prickly-pear cactus and northern alligator lizard is protected. There are ocean kayaking opportunities at this park. Canoeing is not recommended. This park is a popular camping location for cyclists, as it serves as a good location for cyclists wishing to explore the rest of picturesque Salt Spring Islands. Bicycles are allowed on the main roads only and are asked to walk their bikes into the main campground area. Bicycles are not allowed on the walking trails in the park. Bicycle helmets are mandatory in British Columbia. There are salt water fishing opportunities at this park. Fishing is permitted as per provincial and federal fishing regulations. All anglers should check the current regulations issued by Fisheries and Oceans Canada prior to fishing. Anyone fishing or angling in British Columbia must have an appropriate licence. An extensive trail system exists at Ruckle Park, with more than 15 km of trail. A shoreline trail runs from the heritage farm area right through to Yeo Point, along with other inland trail routes that range from easy walks to more difficult hikes. Detailed park trail maps are located at information shelters and convenient points along the trails. For your own safety and the preservation of the park, obey posted signs and keep to designated trails. Shortcutting trails destroys plant life and soil structure. There are regularly scheduled naturalist programs offered during the summer season. Pets/domestic animals must be on a leash and under control all times. You are responsible for their behaviour and must dispose of their excrement. It is extremely important that dogs be kept away from the working farm and livestock within the park. Dogs must be on leash at all times. Scuba divers frequent the waters off Ruckle Park, drifting among the castle-like caves or floating above the bountiful ocean floor, where they will find a profusion of plumose, anemones, sponges, nudibranches, octopuses, sea stars and giant barnacles. Ruckle Park features beautiful ocean views from the day-use area and along the trails, as well as scenic pastoral views of the neighbouring farm. The Heritage Farm feature a number of old farm buildings, including a barn, an old residence and other buildings, still used as working buildingstoday). The big orchard barn has open access (schedule is posted at the site). Other buildings are available for viewing from the outside only – visitors are not permitted inside. While fires are allowed, we encourage visitors to conserve the environment by minimizing the use of fire and using stoves instead. There are a number of group fire rings throughout the campground. Limited burning hours or campfire bans may be implemented. Firewood can be purchased from the Park Facility Operator. Fees for firewood are set locally and may vary. To preserve vegetation and ground cover, please don’t gather firewood from the area around your campsite or elsewhere in the park (this is a ticketable offence under the Park Act). Dead wood is an important habitat element for many plants and animals and it adds organic matter to the soil. You can conserve firewood and air quality by keeping your campfire small. Be prepared to bring a portable stove for cooking. There are six pressurized drinking water stations throughout the campground and day-use areas. Note: The water system is shut down for the winter season between November 1 and March 15. Regular group camping charges per night are the base rate for the site, which is $20.00/group site/night, plus $5/adult (16+, minimum charge for 15 adults), plus $1/child (6-15). Children under 6 are free! This park has a day-use/picnic area; continue straight on the main park road past the campground turnoff to the day-use parking lot. A large grassy area and rugged shoreline at the day-use area provide great viewing opportunities of passing boats and ferries. Facilities at the day-use area include pit toilets, picnic tables and an information shelter. This park has pit toilets at the campground, day-use area and heritage farm. This park has eight sites for recreation vehicles/campers, four are reservable, and the remainder are first-come, first-served. These are set up as RV sites (no hookups), gravel, spots for RVs, trailers or campers. There are 20 walk-in tent sites (tent pads); 10 are reservable, the remainder are first-come, first-served. In addition, there are approximately 58 non-designated sites in the park that are filled on a first come, first served basis. Facilities include pit toilets, cold water taps and group fire rings. Campsite reservations are accepted and first-come, first-served sites are also available. This park has 78 walk-in campsites, located along the edge of the forest and extending across an open grassy area overlooking Swanson Channel. 20 of these sites have tent pads, (10 reservable, the remainder are filled on a first-come, first-served basis). These sites are located approximately five minutes from the parking lot and are popular with cyclists as well. Facilities include pit toilets, cold water taps and group fire rings. This park has eight vehicle accessible campsites, available on a first-come, first-served basis. Campsite reservations are not accepted for the off-season. Facilities include pit toilets, cold water taps and group fire rings.